Snow removal can become such a burden during a long winter. Snow blowers work overtime, your gloves stay soggy, and your goggles form ice crystals that are hard to chip free for each use. Free yourself and your loved ones from the burden of snow removal by installing a heated driveway. Radiant snow melting is an easy way to enjoy your cold snowy winters. Heated driveways do the work so you don’t have too, keeping the radiant cables warm under your driveway so the snow melts on impact and you enjoy a clear driveway even during the heaviest of storms. Winter presents treacherous driving, skiing and sledding accidents, worries about slipping and breaking bones and plenty of other worries. If you have a heated driveway one worry you can cross off your list is snow removal. You can store your shovels and snow blowers for your neighbors to borrow in a pinch or lend them a hand if you feel sorry enough for them. Chances are they will see you sitting inside each time they shovel their own driveways and will be quick to ask you what your secret is. Heated driveways are catching on like a toasty wildfire simply because they are so convenient and affordable. And let’s face it; we could all use one less thing to worry about in this busy world. Municipal and county buildings are leading out in a fast growing trend. Schools and public buildings everywhere are enjoying the added benefits during the winter of radiant snow melting systems. Paying staff specifically to get up early and clear the snow for public consumption is getting harder to do with tighter budgets and worry about public safety. Having a snow melting system in place does the job perfectly and ensures the snow will be melted for even the earliest bird trudging to work or walking their dog. Radiant snow melting systems can be controlled and powered from a central location and cover blocks of property. They are ideal for schools, libraries, loading docks, city buildings, and office buildings as they keep everyone safe and sidewalks are always clear of snow. 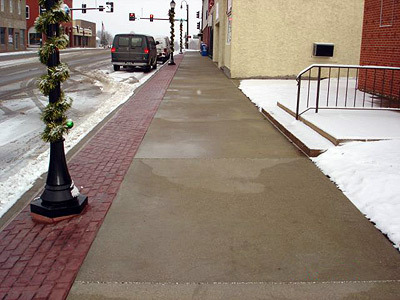 Sidewalks with snow melting systems will never look the same because they will always be clean and safe thanks to the consistent warming the heat cables lying just under the surface. The snow can fall in droves but it will never accumulate on a warmed surface and the public never has to worry about slipping, sloshing, or sliding around on unsafe, un-shoveled sidewalks. Radiant heating cables are a simple solution but nonetheless a solution more and more people are finding handy in a winter riddled climate. Mother Nature can be harsh. She can be brutal and unforgiving during the winter months especially. Man has tried to combat her cold heart in the winter by inventing snow blowers and extra warm clothing. With the advent of snow melting cable, man (and woman) has truly found a sneaky way around Mother Nature’s cruelty. Snow melting cables can combat snow in such a simple way that you’ll hardly believe the radiant snow melting systems can melt the snow for good. As long as your snow melting system is plugged in you can melt the snow consistently all winter long, enjoying the peace and comfort that comes with knowing your driveways, sidewalks, and roof gutters will stay clear all season. Snow melting cables save you time and also save you money in the long run. The radiant heat makes the snow melting systems energy efficient to run and allow you to enjoy the winter rather than shovel your way through it. You don’t just melt it, but you melt it real good, allowing you to focus on other winter matters, like staying warm and snow boarding and drinking hot cocoa by the fire. Radiant snowmelt systems can be designed to fit your specific details and needs. Professionals are ready to assist you in the outline and execution of your automated snow melting system. 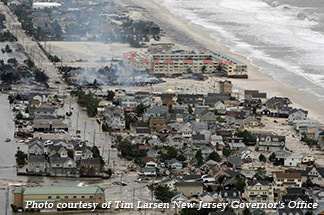 In late October of 2012, the largest Atlantic hurricane on record, Hurricane Sandy, crashed into the Northeastern Seaboard, decimating entire neighborhoods in New Jersey, New York, Connecticut, and other eastern states. The tempest left homeowners facing repairs that ranged from replacing a few windows to rebuilding an entire house. New Jersey and New York were particularly affected by Sandy, but as many as 24 states (and much of Eastern Canada) were also impacted by the colossal storm. Damage in the U.S. was estimated at over $63 billion. Aerial shot of Hurricane Sandy’s aftermath. As residents in New Jersey and New York rebuild, there is no better time to consider installing a roof deicing system. Installing a roof heating system is a smart investment, particularly for residents in cold climates such as Connecticut, New Jersey, and New York. Roof deicing systems can eliminate costly repairs in the future by protecting roofs from snow and ice damage. These radiant roof heating systems are installed discreetly under shingles, metal, or most other roof surfaces, and can extend the life of your roof as well as enhance safety. There are many different types of roof deicing options available that not only can fit your roofing needs, but your budget as well. You can heat the entire roof, just the edge, or only the gutters and downspouts – or any combination. The key for homeowners is to work with radiant heat professionals to determine the best custom roof heating solution for your home. The radiant heat professionals will assist you in finding the best roof deicing solution for you, whether it’s heating just the roof’s edge, the gutter or both. 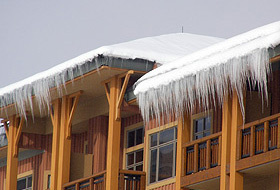 Ideally, it is best to install a roof deicing system and a gutter trace system to eliminate ice buildup in the gutter. Ice buildup in the gutter can damage the eaves and downspouts, but beyond that it can be extremely dangerous for pedestrian traffic below. By combining the protection that comes with a roof heating and gutter heating system, the lifespan of a new roof can be extended and the value of a home can be increased. One of the best roof heating systems on the market that combines roof deicing and gutter deicing is provided by Warmzone, an established leader in the radiant heat industry. Warmzone offers complete roof heating solutions for residents in New Jersey, New York and the Eastern Seaboard, ranging from top products and system design to expert installation support. Roofs and gutters in need of a radiant roof deicing system. If you’re considering installing radiant heat, it’s important that you work with trusted professionals with a proven customer service track record, a wide selection of products, complete system design and engineering services, and expert installation support. With Warmzone, you’re guaranteed all of these. Regardless whether you are looking for a roof heating, radiant floor heating, or snow melting solution, you won’t find a better partner to work with than Warmzone. The professionals at Warmzone will help you find the right system for your specific needs, as well as provide complete services, and unmatched installation support. The best part is that you have a strong partnership with a company that is committed to customer service and will work with you to ensure that the system meets or exceeds your expectations. Call a radiant heat expert today to learn more about your roof heating options at 888.488.9276. Send us your project information and receive a free roof heating quote. There have been several alarming reports trickling in from consumers living in colder states. Consumers who once donned thick layers of snow gear and carried heavy shovels or pushed cumbersome snow blowers are now stating they receive snow but it does not accumulate on their driveway. This is alarming to them, but here at the Department of Missing Snow it is second nature to provide consumers with answers to their snow problems. 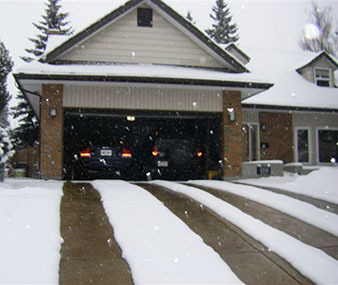 The heated driveway is the number one reason driveways are missing snow after a snow storm. If you or someone you know is experiencing these ice-free mysteries consider investigating a radiant heated driveway. Radiant heating cables may be the culprit in your missing snow mystery. These radiant heat cables lie just below the surface so you may not even know they are there, but they are doing hard work and making the jobs in our department very easy. Missing snow is not a problem for everyone, so feel free to report your findings to your neighbors if they glance at your heated driveway with longing and confusion. Explain to them how having a heated driveway keeps your driveway clean and the ice build-up stays away too. Refer them to the Department of Missing Snow where experts can talk with them about creating their own case and explain to them how heated driveways will remain our number one suspect in missing snow.